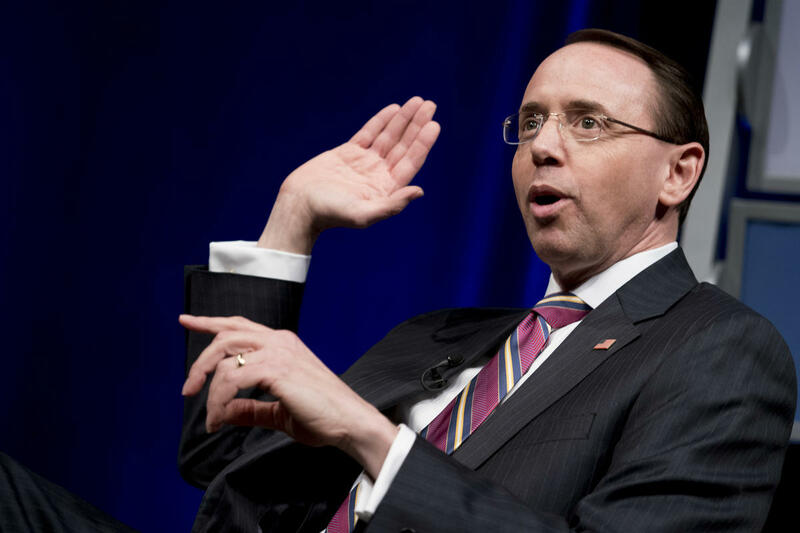 Nonsensible Shoes: Is president Trump sending a subtle signal to his base on Rod Rosenstein? Is president Trump sending a subtle signal to his base on Rod Rosenstein? Yesterday on Hot Air, Ed Morrissey was ruminating on the meeting between president Trump and Deputy Attorney General Rod Rosenstein, that came about as a result of Rosenstein apparently saying that somebody should wear a wire, record the president* ranting and then invoke the 25th amendment. Overturn a legitimate election? Ha. Of course Rosenstein said he was speaking in jest. That's a weak defense. So the meeting happened and Rosenstein was not fired by the president. Ed Morrissey was following the developments and something he wrote caught my attention. The president says he's got a good relationship with Rosenstein, but does he really? 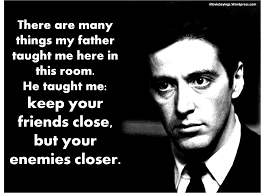 The phrase "Keep your friend close and your enemies closer" has been variously attributed to Sun Tzu, Niccolo Machiavelli or Petrarch but was made popular when it was used in the movie The Godfather Part 2. The president may be employing that strategy in this case. That is especially true given the impending election that could change his fate should a less and less likely blue wave materializes. But that's not the headline here. Here's what caught my eye: "This need for this meeting seems almost ancient at this point." Could the delay be the signal - I'm not impatient, so don't you be impatient, wait for the midterms to be over and I'll deal with Rosenstein then? While the president may actually be quite smart, he doesn't come across as patient, though I suspect he can be when he needs to be. I don't believe the Kavanaugh hearings were a distraction. The president had ample opportunity to meet with Rosenstein during the past three weeks. Perhaps the signal was that Rosenstein is not the big fish here, or that he has something else brewing on Rosenstein. The takeaway for voters regardless should be to turn out and vote for Republicans in the senate and congress. Because continued control of both the senate and congress gives the president more room to maneuver come November. In any of the above scenarios, more Republicans help us deal with not only Rosenstein, but Mueller, Sessions and anyone else seeking to undermine or not support the agenda that is making America great again. *Disclaimer: I know the president is not exactly known for his subtlety, but that makes this possible signalling all the more brilliant. Despite the president's critics constantly claiming the president is a buffoon, he's actually quite smart; shrewd even.